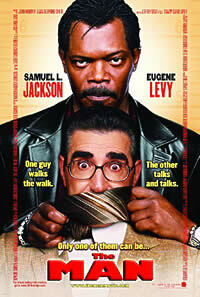 Sorry folks, I didn't really like The Man, with Samuel L. Jackson and Eugene Levy. It had a few funny moments, but it was mostly predictable and mindless. As my dad said (paraphrased) after the disc stopped spinning, "the situation of a cop and a dufus [partner] has been done too many times". I suppose there were a few unique attributes that made this movie different than previous renditions of the same scenario, but I wasn't particularly impressed. Perhaps the worst drawback for me was heavy reliance on hard language to evoke a comical effect. I tend not to laugh just because someone uses profanity. For example, I came across a stand-up routine by Robin Williams relating to golf. Basically, he was simply screaming profanities at the top of his lungs in a Scottish accent. Not too funny. I prefer more intelligent, yet innocent (or senseless and ridiculous) humor.